Here’s an update on the Jussie Smollett case in which the star of Fox television’s Empire claimed that he was beaten in Streeterville early last Tuesday by two people who put a noose around his neck, poured a chemical on him, and lobbed anti-gay, anti-black slurs while shouting that Smollett was in “MAGA country," a reference to Donald Trump’s 2016 “Make America Great Again” slogan. • A source close to the investigation revealed that the purported threat letter against Smollett that was received days before the alleged attack was mailed from Chicago’s southwest suburbs. 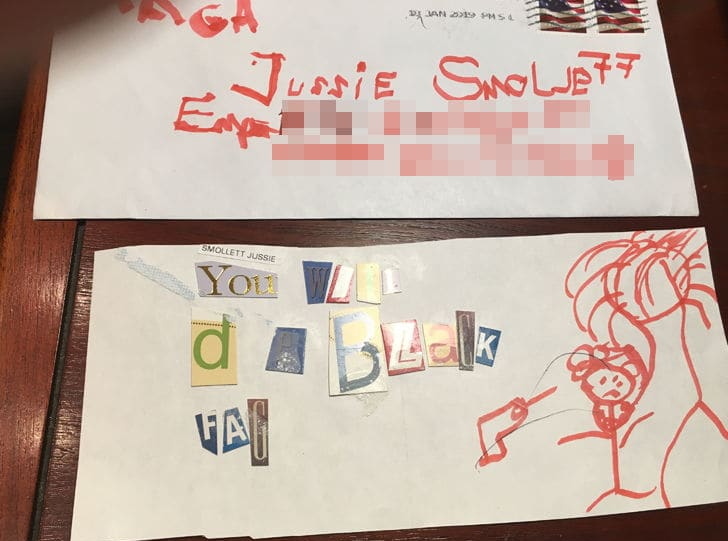 The envelope was addressed to Smollett at the Empire production offices in Chicago and had “MAGA” scrawled in the return address space. A white powder in the letter is believed to be Tylenol, according to other media reports. The investigation into the letter’s origins is being quietly conducted by the FBI. • Subpoenas have been issued to ensure that phone records from Smollett and his music manager are received. The two claim that they were speaking with each other at the time of the attack and the manager, Brandon Z. Moore, claims he clearly heard racist slurs and “MAGA country” being said. • Police have dismissed the claims of a woman who lives in Smollett’s building who reported seeing “rednecks” with rope in the area 90 minutes before the purported attack. • After a vigorous performance Saturday night at an LA club, Smollett said that—against his lawyer’s wishes—he wanted to straighten some things out about his story. Contrary to the original TMZ report that Smollett “fractured a rib,” the singer said after performing on Saturday that his rib had only been “bruised.” He also stated that, despite the same TMZ report, he was never hospitalized—merely treated and released. Smollett failed to make those clarifications in an earlier list of clarifications released to TMZ. He then declared himself “the gay Tupac” and performed his encore. Looks like he's on the mend.